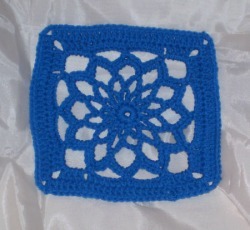 Finished size: about 8 1/2 inches, depending on your crochet style. Rnd 5: Ch 1, work (3 sc, ch 2, 3 sc) in each ch-7 sp around, join with a sl st in first sc. Rnd 7: Sl st into next ch-7 sp, ch 3, 3 dc, ch 3, 4 dc all in same sp, *(sk next sc, hdc in each next 7 chs) twice**, 4 dc, ch 3, 4 dc all in next ch - sp, repeat from * around, ending last repeat at **, join in top of beginning ch-3. Rnd 8: Ch 3, dc in next 3 dc, *work 2 dc, ch 3, 2 dc in ch-3 sp, work a dc in each st to next ch-3 sp**, repeat from * to ** twice more, 2 dc, ch 3, 2 dc in next ch-3 sp, dc in each remaining st, join with a sl st in top of beginning ch 3. Fasten off.